The apple tree in the back yard has gone bonkers this year. 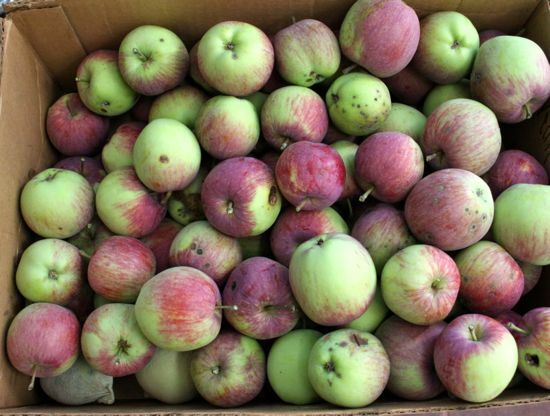 I've made a first run at the apple harvest, filling this box more than half way. The apples are small and slightly underripe (read: pleasingly tart) and bake into lovely things. 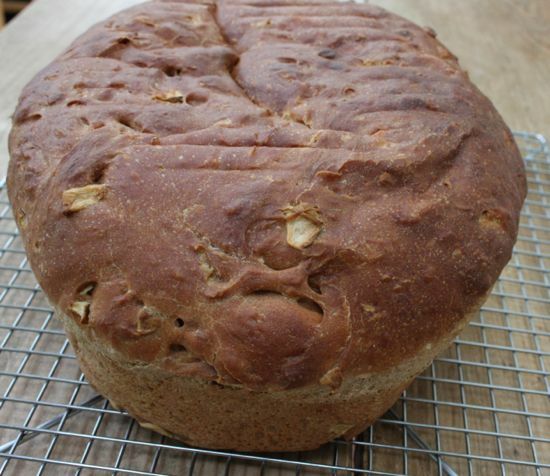 Like this yeast-based apple bread, which smells amazing when it's baking and goes wonderfully with cheeses (we've tried chevre and cheddar so far; brie would be delightful). 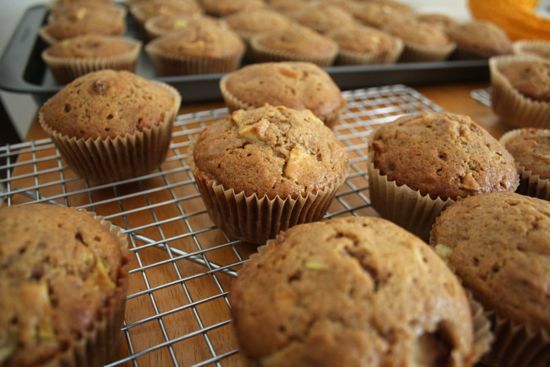 Or these apple muffins. I may have made 6 batches of these for a neighborhood End of Summer community event, and my neighbors may have eaten every single one. 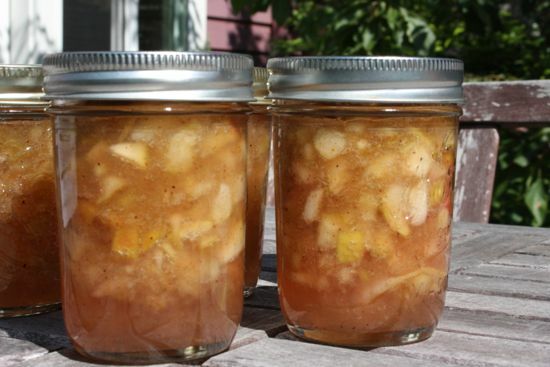 And these jars of apple preserve. Slightly lemony and spiced with nutmeg, it's a bit like having a cup of apple pie filling in a jar. So far, we've put these preserves on toast and on yogurt. I bet they'd be amazing slightly warm and poured over ice cream. Or pancakes. 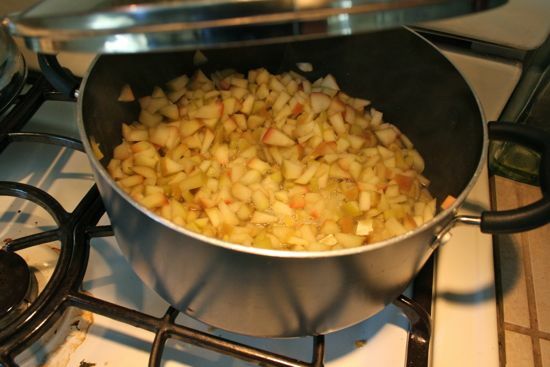 And there were still apples left over, so naturally I made apple sauce. And an apple cake (doused with brandy). At the moment, there are no more apples in the house. But there are more on the tree, roughly about the same number as I've picked already. And since there are fewer apples on the tree in total, the tree is busy make the remaining apples larger. Does anyone have a portable apple press? Or a juicer? I could use one of those... Otherwise, you are all going to have to come over and eat Baked Things With Apples In Them. Yum! It's so hard to get good cooking apples here, I might have to look into finding somewhere that has trees of old-fashioned varieties. I hear Sturmers are good for cooking - you need that tart flavour which is sadly lacking in most apples these days, even the Granny Smiths seem sweeter than they used to be. I also like eating really tart apples, so maybe I'll just fly over and eat some of yours. Mmmm, puts me in mind of my Grandmother's special applesauce. I can even smell her secret ingredient: frshly ground nutmeg. In addition to a nice Brie on the side, I think that apple bread would enjoy some homemade Fromage Blanc spread on it. Enjoy this year's abundant harvest. A pro apple grower of my acquaintance told me that apples tend naturally to be alternate-bearing and that commercial growers use various cultural practices to discourage that behavior so as to have a good crop every year. I know when I had Fuji Apple trees in my yard they were definitely alternate bearing, but in my ignorance of apple proclivities, I assumed weather was the culprit. We had a good crop of pears last year but not a pear in sight this year. I'm pretty sure pears alternate like apples... Wouldn't that be lucky of me if my two trees really alternated with each other? So many apples this year and all pears next year?